As with any one-day show, it was a long day/evening, but there were great rounds of racing and a 0.0612 margin of victory for the Open Fuel class! Congratulations to winner Ron Gledhill aboard his Top Fuel Nitro Harley, running 6.739 at 199.79 mph to runner up Len Darnell, running 6.753 at 195.22. Len did an outstanding job as #1 Qualifier at his first WMDRA race, running his Suzuki in the 6’s all day long! A big thank you to all the racers that supported the one-day show and many thanks for your professionalism and sportsmanship… the WMDRA has been invited back to Las Vegas (date to be determined)! Arizona racers Fred Love and Bill Bentz battled it out in the Pro Gas class, with the win going to Fred Love, after both racers suffered mechanical issues. 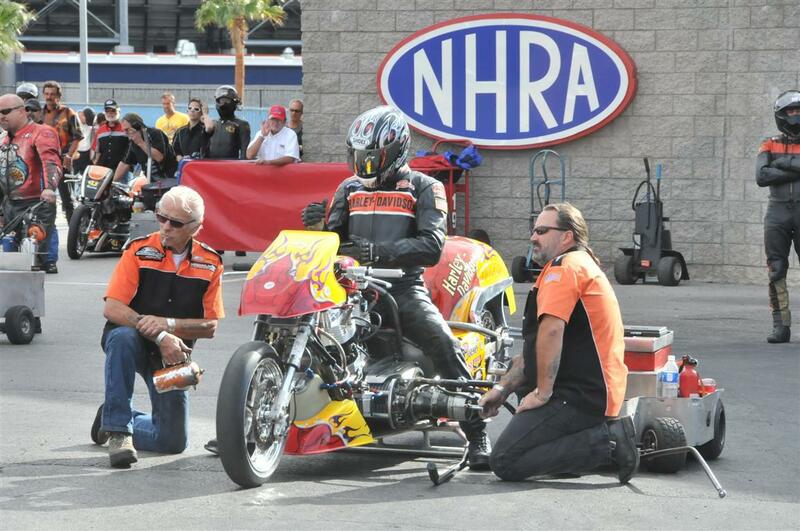 Bentz enjoyed his maiden voyage riding Bob Bongiorno’s Pro Gas bike, previously ridden by Scotty Pollacheck, who is now competing in the NHRA Full Throttle series aboard the Star Racing Pro Stock Motorcycle. Noah Penright took the Pro Stock class win with an 8.570 at 154.63 mph over #1 Qualifier Paul Morris, who also suffered mechanical issues. Top Gas winner and #1 Qualifier John Hren took out runner up Thad Wiltz with an 8.440 @ 132.26 mph over 8.713 at 152.28 mph. 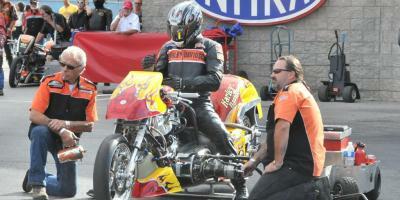 Keep an eye out for Keith Kizer’s Dragbike POTW feature on John and his family. The Pro ET win went to local favorite Dennis Sacco over Keith Washington from Las Angeles, California. And Street ET went to Dana Winters out of Veradale, Washington who travelled almost 1200 miles to race his H2 750 2-stroke Kawasaki down the Strip at Las Vegas for his birthday! Special thanks to Terry and Peg Brown for their undying support of the WMDRA and for all their hard work on the raffle… congratulations to 50/50 winner Stan Sheppard! Congratulations everyone and we’ll see you all in Sturgis! Sturgis event or contingency sponsors welcome and appreciated.